I've got a bit of a craving for chocolate pudding pie. Odd, since I hardly ever eat puddings. But the thought of something not only chocolately but thick, smooth, and creamy sounds delicious. I found this scrumptious recipe by Melissa Roberts at gourmet. Note: I swapped out her pastry dough for my own all butter crust. You can find her original recipe for pastry dough here. Whisk together cornstarch, 1/3 cup sugar, cocoa powder, and salt in a 2-quart heavy saucepan, then gradually whisk in milk. If possible a flat whisk works best. Brig to a boil over medium heat, whisking constantly, then boil, whisking, two minutes until mixture thickens. Remove from heat and whisk chocolate and vanilla until smooth. Pour filling into cooled shell. Place plastic wrap over surface to prevent a skin from forming. Place in fridge for a minimum of 2 hours. Just before serving, beat heavy cream and remaining 2 tablespoons of sugar just until soft peak form and hold. 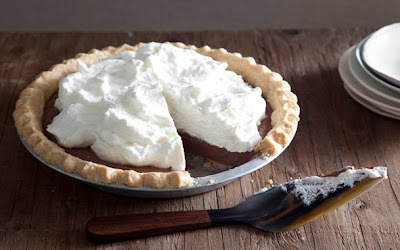 Spoon onto pie and garnish with chocolate shaving. In a large bowl whisk together flour, sugar, and salt. Dice one stick of very cold butter into 1/2-inch pieces. Sprinkle the butter cubes over the flour, and using the pastry blender, cut butter into the flour. Make sure to work the pastry blender evenly over the mixture until the butter pieces are the size of tiny peas. Drizzle 3 tablespoons of ice water (not the ice) over the flour mixture. I find 3 tablespoons of ice water usually is enough but sometimes 1 or 2 additional tablespoons may be necessary BUT add 1 tablespoon at a time. It's always easier to add more water, then to try and repair a too wet dough. Using a rubber spatula, gather the dough together. Remember, you want just enough water for the dough to come together. Once you start to get large clumps with the spatula, use your hands to gather the rest of the clumps together into a single mound. Place mound on a large sheet of saran wrap. Shape into a disk. Wrap and refrigerate for one to two hours, before rolling out. I find rolling out dough between two sheets of plastic makes the cleanup easier. Roll out dough into an 11-inch round. Fit into a 9-inch pie plate. Trim edge but leave a 1/2-inch overhang, then fold overhang under and flute the edges. Prick bottom of pie shell, then chill shell in freezer for 30 minutes. This will prevent shrinkage. While shell is chilling, preheat oven to 350º F with a baking sheet in the middle rack. Butter the shiny side of a sheet of an aluminum foil. Firmly line the frozen pie shell with the foil (buttered side down.) No pie weights necessary. Bake on baking sheet until pastry is set and edge is pale golden, about 25 minutes. Carefully remove foil, then bake shell another 15 or 20 minutes, or until crust is golden brown all over. Cool shell completely.